With the right Enterprise Resource Planning (ERP) system, nonprofit organizations can stop spending time navigating data management and start focusing their employees and other valuable resources on driving their mission. While the term Enterprise Resource Planning is all encompassing, nonprofits of all sizes can take advantage of a scalable ERP system that is designed to accommodate the requirements of nonprofit organizations. The lack of a profit motive does not mean a non-profit organization can afford to be less focused on its finances. In fact, with scarce resources, efficiency in allocation becomes even more important. The allocation of funds and subsequently reporting on operating expenses, salaries and short and long term project funding all require complex reporting. The manual workload to produce these reports is frequently very high which absorbs significant time and resources. The return on investment of ERP for non-profits centers around delivering accurate and easily generated reports. This frees up substantial administrative time that can then be allocated more productively elsewhere. By BroadPoint -BroadPoint is Gold-Certified Microsoft ERP partner with nearly two decades of experience successfully implementing and optimizing ERP systems for organizations of all shapes and sizes across the United States. Yes there are lot of benefits, no doubt in that. Benefits of an ERP software for nonprofit organisations helps greatly in management of grants, funds, commitment, budget and fundraisings. With the right ERP system, nonprofit organizations can stop spending time navigating data management and start focusing their employees and other valuable resources on driving their mission. 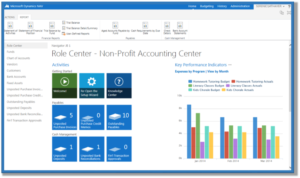 While the term Enterprise Resource Planning is all encompassing, nonprofits of all sizes can take advantage of a scalable ERP system that is designed to accommodate the requirements of nonprofit organizations.